Puerto Rico is a beautiful place, somewhere I could spend days searching the jungle for waterfalls and trying to find the best beaches. 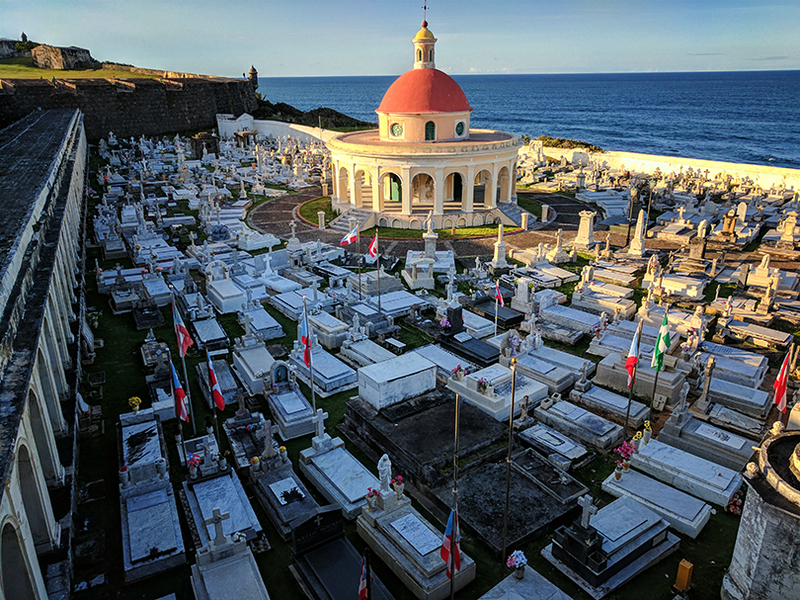 We made the smart choice of staying in San Juan, Puerto Rico for a couple days after we arrived back from our cruise in the Caribbean. The day we ported was the last day of La SanSe Festival in Old San Juan. 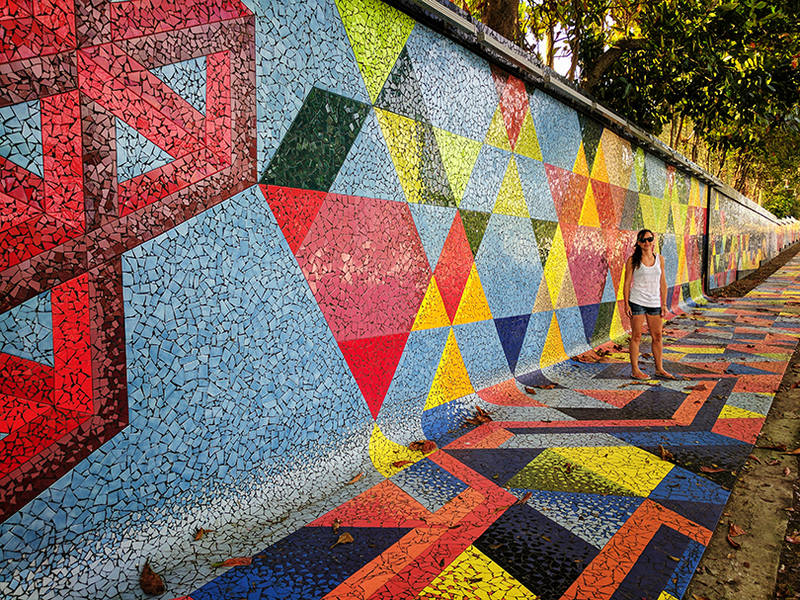 The San Sebastian Street Festival (Fiestas de la calle San Sebastian), or for short “La SanSe”, is the biggest festival in Puerto Rico and has been held on the street of San Sebastian in Old San Juan since 1970. La SanSe was created in honor of the Christian Saint Sebastian who was martyred. In today’s time the festival has evolved, although plenty of Puerto Rican culture is still involved. We were made aware of the festival during our Uber drive as a string of party buses cruised through the streets. 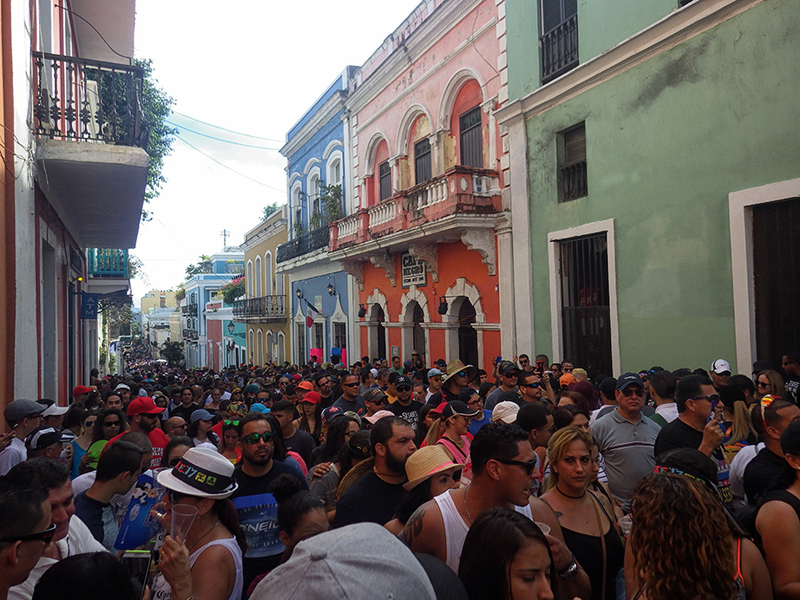 We walked through Old San Juan and although I haven’t been to Mardi Gras, I would imagine La SanSe is VERY similar. There were hundreds of thousands of people, and the later it got the more alcohol came out of the bars and onto the streets. Even the houses that lined the small streets looked like New Orleans with the colors and balconies. There was music so loud you couldn’t hear yourself think. There were people wearing huge paper mache masks, dancing, booths, food- oh and did I mention LOTS of alcohol and people? 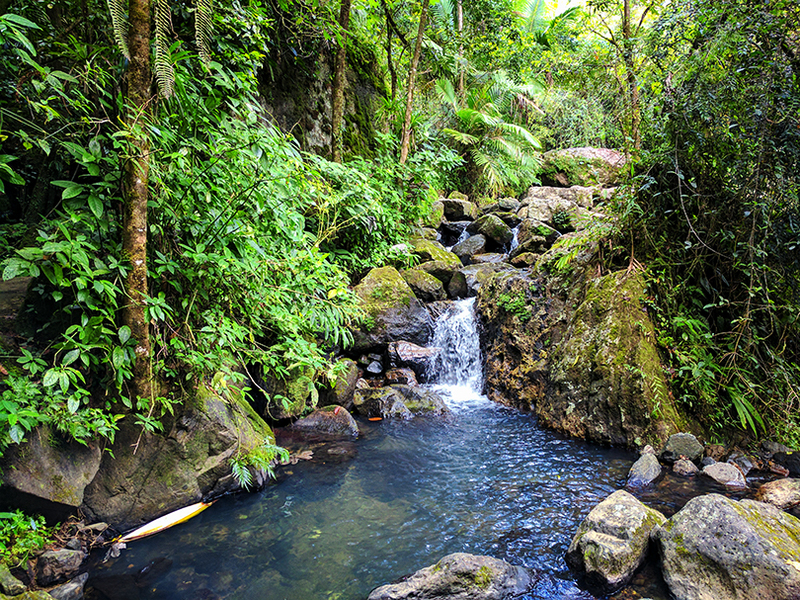 Yunque is the only tropical rainforest in the United States and is only an hour from San Juan City. The Yunque park was beautiful, there was lush green everywhere, and we saw creatures like lizards and large moths. The trail is paved for some of the hikes, but it can be slippery so make sure to bring good traction shoes. We spent roughly 3 hours by going to the visitor center and driving to different falls, but you could undoubtedly spend a whole day doing hikes if you wanted. La Mina was my favorite because at the end of the hike was La Mina Falls that we could swim in. Don’t be drawn to the American fast food and restaraunts in Puerto Rico, but instead try the authentic food that’s still around. Puerto Rican food is a mixture of Spanish, American, African and Taíno influences. Your best option of finding cheap Puerto Rican food is by looking for food trucks. We found tasty local food including some arroz con grandules (rice with pigeon peas), which is considered a national dish. San Juan is the oldest city in the U.S. and was discovered by Columbus. He originally called the island San Juan Bautista and the city Puerto Rico (rich port). Later the names were switched by a confused cartographer. Soon after Puerto Rico caught the attention of European countries and pirates began to arrive at it’s waterfronts. 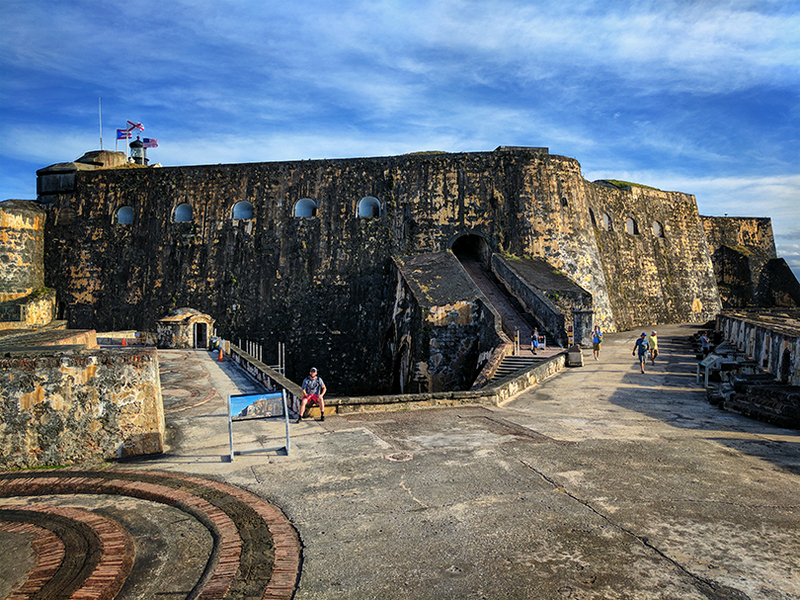 Two forts were built to fend off the attacks, Castillo San Cristobal and Castillo San Felipe del Morro. These fortresses are amazing places to visit for a beautiful view and a look into the city’s history. **Since we love to visit national parks we bought the national park card for $80 and it gave all 4 of us entrance to both fortresses as well as the Yunque National Park. The pass will continue to get a group of us into all U.S. national parks for a year. 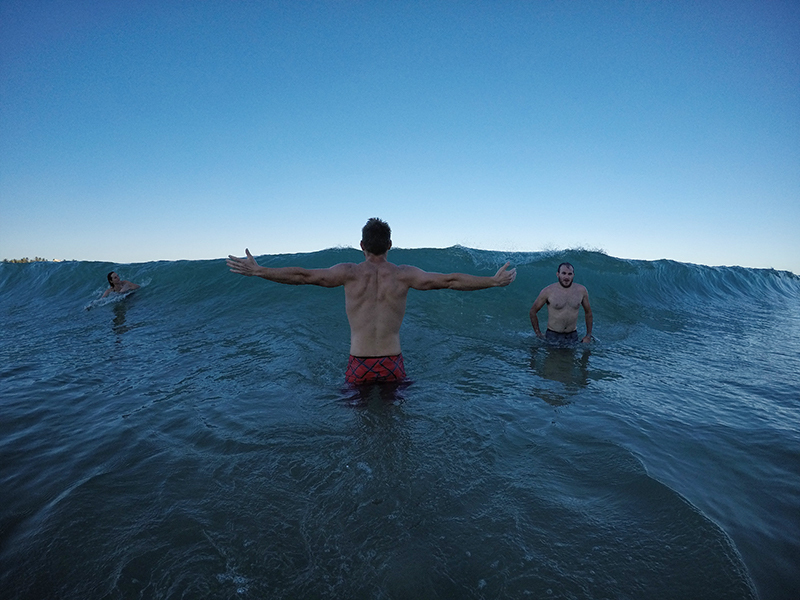 We spent our last afternoon in Puerto Rico on the beach riding the waves. To be more accurate, we spent the last afternoon getting pummeled by the intense waves on the beach. The ocean would spit us out and we’d return laughing like idiots and shaking the water out of eyes/mouth/ears only to repeat the cycle over and over. I couldn’t have thought of a better way to spend the day. Bioluminescent Bay has sand and water that glows. This magical look is because of a chemical reaction in the plankton that makes them so luminescent. The easiest way to see them is probably to book a tour that takes care of your transport and kayaks to see the plankton at night. There’s also the option of taking a ferry over to the bay and looking for the plankton by yourself. Rio Camuy Cave looked very cool, we just didn’t have time to go through it. Also, the last time we looked for a cave was in Slovenia and that didn’t end well! 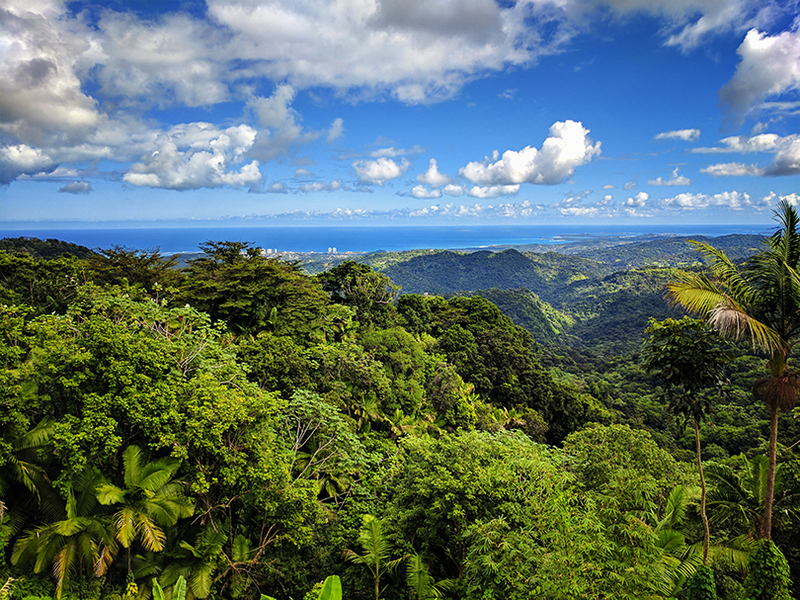 If you want to go explore, there’s plenty to discover in Puerto Rico! Brilliant idea to take the cruise, then stay a few days to explore PR. 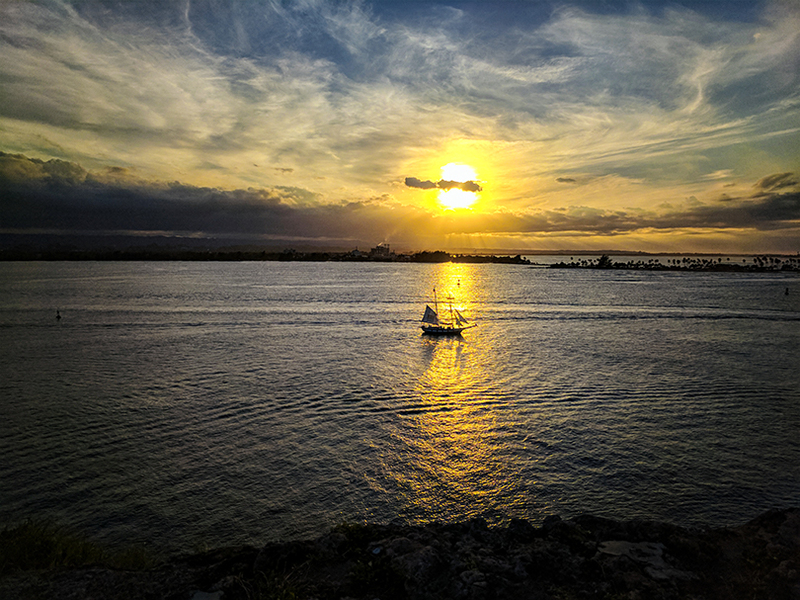 Puerto Rico is an awesome place to visit. You explored some of my favorite places. And the food… always something great to try. I wish I could remember the names of my favorites. There is an amazing zip line trek though the rain forest where we ended at the top of very tall tree and rapelled to the ground. Thanks for renergizing my memories!